After hearing the ads on my favorite podcast for a month (Plug: The Tony Kornheiser Show) and already having heard some my brother and some friends rave about it, I decided to dive into the food delivery service known as Blue Apron. My first shipment of three meals arrived this past Friday. Mom is not a fan of fish at all, but the delivery came with a note advising to prepare seafood items as soon as possible, so I chose to fix the fish first. Let me say at the outset, the two filets that were included in my delivery were two of the prettiest pieces of fish I have ever seen that didn’t come directly from my local seafood shop. I had half a mind to chuck the scripted recipe and simply grill these two filets In my oven and be done with it, but that would’ve been cheating. One bit of advice: Whatever the stated prep time is, double it (at least) to get an idea of how long this meal will take for you to cook. This meal had a lot of chopping (potato, turnip, apple), so I decided to use the Vitamix my mom bought a year ago but (for a lot of reasons I won’t go into here) had not yet been used to assist with the chopping. That helped with time, but it still took a while to coordinate everything. The recipe included one huge turnip, which I diced, a potato and an apple used to make a vinaigrette (which turned out fantastic). All in all, a lot of work, but the dish turned out very well, and even though I fried the fish in a pan instead of grilling, the protein lived up to the advanced billing. I did realize though as soon as I had finished preparing and cooking the meal that Blue Apron would not be suitable for a weeknight after working until 7pm. It’s great, but it’s for weekends only. This one seemed like a mistake from the get go. Lot less prep time, but I had to change the recipe a bit since I don’t do spicy very well. Even though this had less prep time (and no Vitamix needed for chopping), the dish did not turn out as well as the first evening. The menu included rice with roasted chickpeas (and hence, I learned an excellent way to ruin a perfectly good serving of rice is to dump roasted chickpeas into it), fresh carrots, dates, almonds, Red Harissa Paste and Labneh cheese. I had my doubts but followed the recipe as written, only cutting out the almonds (they were simply a garnish) and using only half of the Harissa paste. I will say it turned out better than I thought it would, but it’s not something I would want again. Sorry, no pictures of the food, because I was so busy chopping, prepping and cooking that, when it came time to eat, I didn’t bother with my phone. Overall, Blue Apron does deliver top notch ingredients that are probably above what I would normally buy at the grocery store (in the case of the fish, that’s a definite), but bear in mind, even though they deliver to your door, it’s a lot of work and it is an investment of time. If you have the time and the energy, these are worth a try, at least once. I still have one meal (Roasted Pork Steam Buns) that I will try this weekend. Hi Barry, thanks for the review! 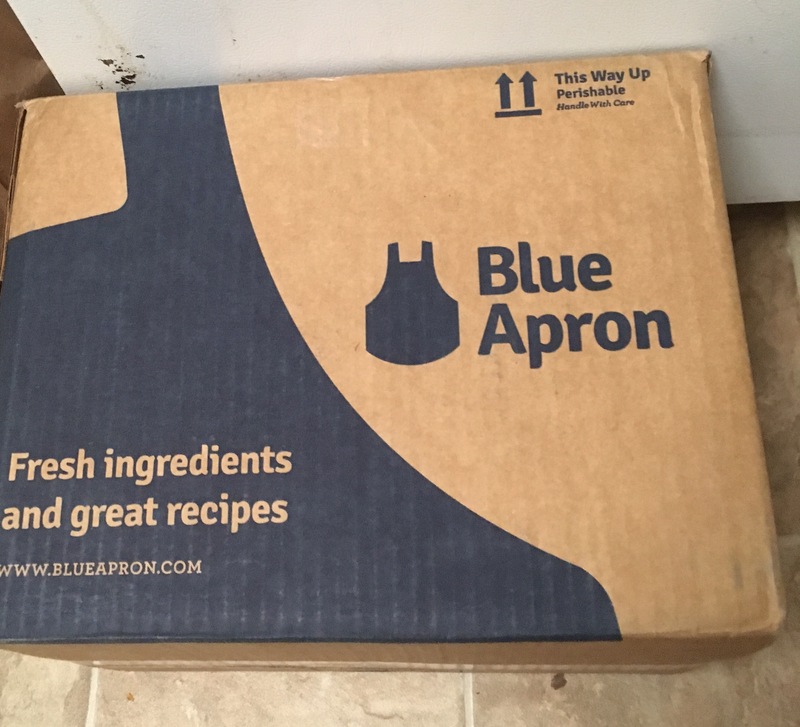 We’ve been thinking about taking the Blue Apron plunge ourselves. We just created a program called the Dusty Blender Challenge specifically for Vitamix users who aren’t getting the most of their investment. Sounds like something your household might benefit from!